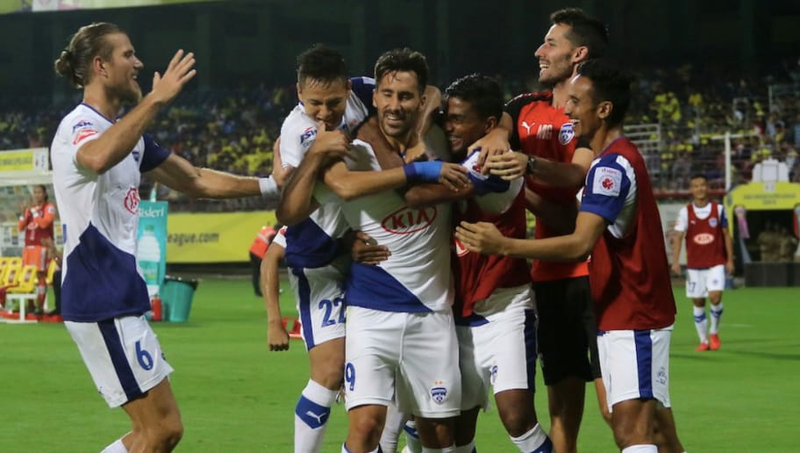 ​Bengaluru FC secured a 2-1 win over Kerala Blasters at the Jawaharlal Nehru stadium in Kochi thanks to a late own goal. Earlier, Sunil Chhetri had given the away side the lead but Slavisa Stojanovic equalised from the penalty spot. The match was played at a sedate pace as the humidity seemed to affect both teams as they looked sapped out of energy for most parts of the game. Despite that, they tried to play good football and created some good chances throughout the 95 odd minutes of play. An early opportunity fell to local lad CK Vineeth who was picked out by Len Doungel, but the forward's attempt went over the bar. Soon after that, the Blues took the lead through captain Sunil Chhetri, as he slotted calmly past Naveen Kumar. Replays however showed that he was clearly offside and the goal should have been disallowed. The Blasters attacked immediately from kick-off and from Prasanth's inviting cross, Len could only fire his attempt into the side netting. Kerala were on the front foot a minute later and this time, Prasanth created space and took the shot himself but Gurpreet saved well. As the home side continued to apply pressure, they were awarded a penalty after Sahal Abdul Samad was brought down by Nishu Kumar inside the box. Stojanovic stepped up to the mark and converted the spot-kick, his shot bouncing into the net off the underside of the crossbar. The second half got off to a delayed start due to a power failure in the stadium but once the match restarted, both teams continued to press in search of the winner. In the 72nd minute, Stojanovic sent in a lovely cross but Albert Serran headed it away from danger beautifully. Immediately after that, the home side missed their best chance of the half, as Vineeth put his attempt wide after he was put through brilliantly by Prasanth. There was some handbags as well as tempers flared with Vineeth and Serran having a go at each other, but nothing happened eventually. Things are heating up in Kochi as @ckvineeth and @alberto_sp_3 can't keep their tempers in check! A couple of minutes later, Bengaluru tried to capitalise on the counter and the ball was slipped through to Miku. The Venezuelan turned beautifully inside the box and cut back a lovely pass for Xisco to shoot. The Spaniard's attempt was saved by Naveen but the ball hit Nikola Krcmarevic and went into the open goal to leave the home side shattered and the Yellow Army disappointed. The result means that Bengaluru FC cemented their position at the top of the Indian Super League table, with 13 points from five matches. Kerala Blasters suffered their first loss, but remain in sixth position with seven points from six matches, having won only one game.